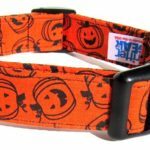 If your dog refuses to wear a costume, no matter how many treats you bribe him with, stop stressing and check out these Halloween collars for dogs. Jack has no interest in costumes, but since I love Halloween and he has to wear a collar anyway…I thought I would look for other ways to get him in the holiday spirit. How cute are these collars and ties? 3 sizes, 8 different patterns, a detachable bat design and an eco friendly buckle. What’s not to love about it!! Made in the USA this adorable dog collar is available in 3 sizes – medium (14″-22″), large (17″-27″) and x-large (20″-34″). A Polypro webbing is used instead of thick nylon, giving it the strength you want without the weight on your dog’s neck. This scary 1“nylon collar has a plastic buckle and metal d-ring, and is available in 2 sizes – medium (10″-18″) and large (18″-26″). Love the selection!! 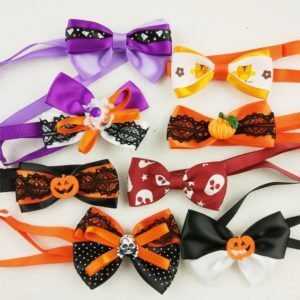 15 piece set of bow ties made from lace and polyester come in a variety of designs such as pumpkins, skulls, bats and ghosts. Dress your dog (or cat) up in a different one every day in the weeks leading up to Halloween! Available in small and large, who can resist this spooky pumpkin design with the pumpkin shaped bell? Ghosts, skulls, pumpkins and bats…yep that about sums it up! Made in the U.S.A.
Love, love, love the design!! Constructed in the USA this 1″ wide dog collar is available in 3 sizes – medium (14″-22″), large (17″-27″) and x-large (20″-34″). Polypro webbing instead of thick nylon gives this collar strength without the bulk so it’s lighter on your dogs neck for extra comfort. Available in sizes XS-XL, no one will get left out, it’s machine washable and made in the U.S.A. Designed and made in the USA, this 1″ wide collar is available in 3 sizes – medium (11″-17″), large (15″-24″) and x-large (20″-29″). 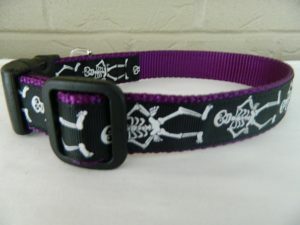 It comes with aeavy duty plastic buckle and metal d ring the skeleton design is fab! 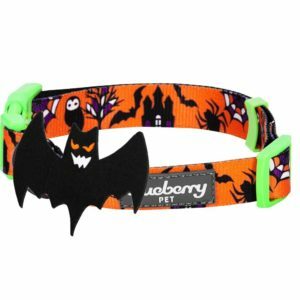 Your pooch may not be fond of costumes, but with these Halloween collars for dogs, he’ll still be fright night ready. 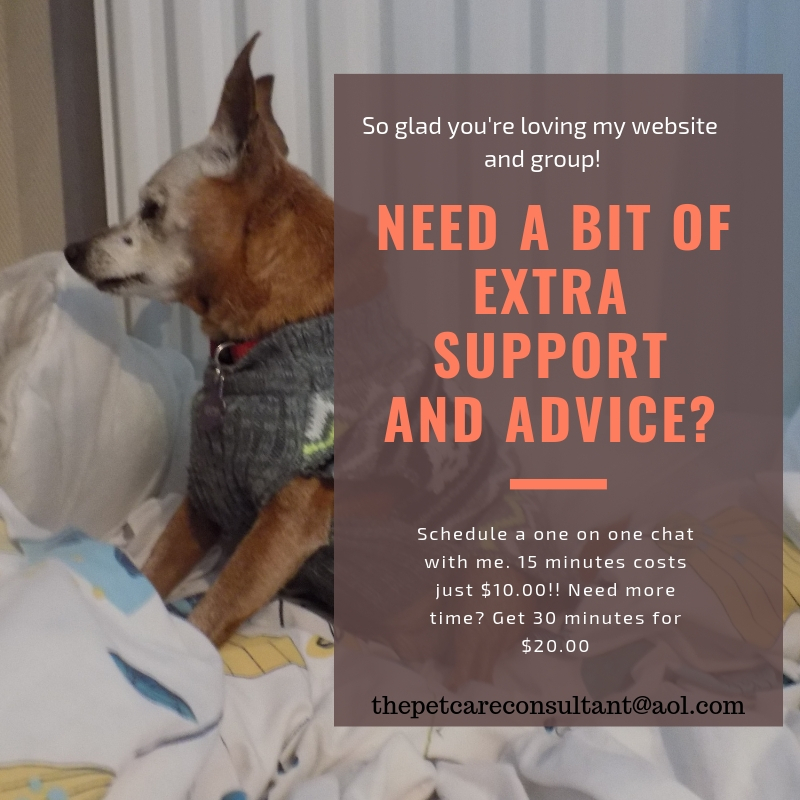 *There are affiliate links in this post, which means if you purchase anything I make a few pennies…literally. That money helps me help homeless animals through donations, fostering and my spay/neuter project called FIxing Spain.